Your little sailor will be ready for the high seas in this round, crochet sailor hat. The pattern uses simple stitches. Work it continuous from start to finish, which means there is no need for assembling parts. It's a great project for any crochet experience level. This is a fast project that uses approximately half a typical size skein of worsted weight yarn. Use the remainder of the skein to crochet a matching diaper cover or baby booties for a complete outfit. Click on the pattern image to download and print the instructions, or check out the Guide for Adobe Printables for additional help. 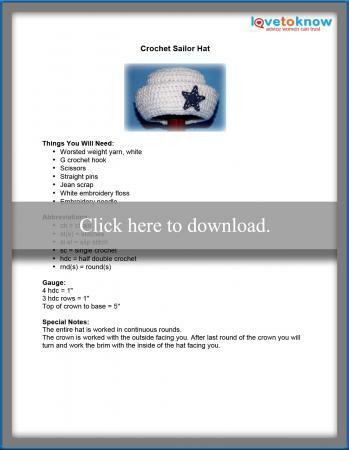 Don't discount this hat project if your baby is no longer a newborn. You can easily apply alterations to this pattern to fit a baby's head up to 12 months. Rnds 1-6 of the hat pattern are increase rnds that enlarge the circumference size. The repeating pattern of each of these rnds increases the total by eight stitches. Continue to st increase rnds in the same manner until the circumferences matches the size you are adjusting to. Keep in mind the hat will stretch on the head for fit. Continue the remaining rnds after the increase rnds until the crown top to brim measurement matches the size you are adjusting to. No adjustments to the brim pattern are necessary. The brim will automatically adjust to the new increased stitches. The rnd numbers and the finished total of stitches will have changed with additional increase rnds. If the pattern of the increase rnd on the brim still has additional sts to crochet, simply stop in the middle of the increase. Do not proceed past the end of the rnd. You can make changes to the pattern appearance if a sailor cap is not what you are striving for. Here are a few ideas that may assist you in customizing and using your hat. Changing the color is an obvious choice in altering the hat's appearance. Pastel pink, yellow, green, and lavender will make this ideal as a complementing accessory for a little girl's outfit. Bright primary colors are perfect choices for a little boy. Attach a crochet or silk flower to the brim to further enhance the hat for a little girl. For a more distinct sailor hat, substitute the denim star applique with an anchor shape. If you would prefer a beanie-style hat instead, omit the brim instructions in the pattern. While dressing your baby in adorable outfits is a natural attraction, cute outfits are also desired for baby photo sessions. As a sailor outfit, this hat would be ideal for an infant of a Navy sailor. It seems photography has become a popular occupation with just about anybody who owns a camera. With fancy lenses and editing software so readily available, honing those skills has become even easier. To set a photographer apart from the masses could be what they have to offer. Photo props with various themes are one of the options that do just that. Grab your hook and stitch hats in all sizes and with several variations for your customers to choose from.